My porch has been decorated for Fall for a couple of weeks now, and I'm finally getting the rest of the house decorated as well. During this season of change in my life, I've been rather slow to decorate. I've discovered that my desire to decorate for Halloween has dwindled as my children have grown up (although my desire to eat Halloween candy hasn't dwindled a bit!). Still, I want change things up a bit for this glorious season. I sometimes find my foyer hard to decorate. It's a nice-sized entry, but I like to keep it free from too much stuff. I do have one antique dresser in the foyer, and it's always held a much-loved elephant lamp. To add just a bit of Fall to the dresser, I created a simple vignette. I was born and reared in West Tennessee. My grandfather (not many generations back, but my dad's father!) was a sharecropper. By the time I came along, he'd managed to buy a small piece of land for growing cotton. My childhood memories include many images and smells of that cotton field. When I think of crops being harvested, I think of cotton. I was tickled to find these faux cotton stems from the Perfectly Imperfect shop that look so realistic! 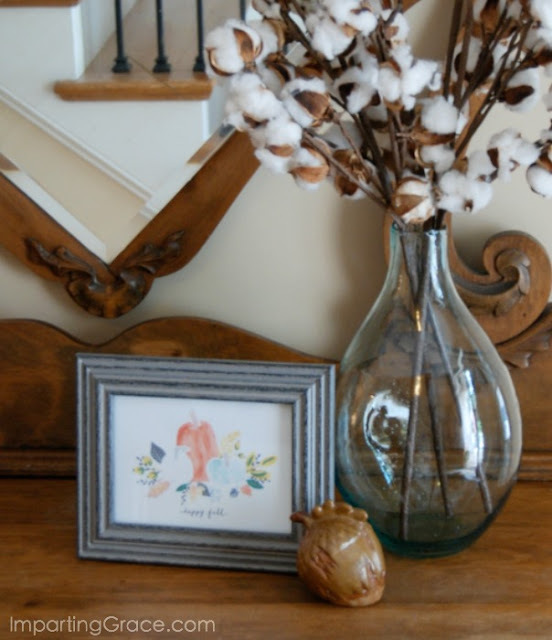 To create this Fall vignette, I simply placed my cotton stems in a blown glass vase. They "arrange themselves" beautifully, I think. I found the free "Happy Fall" printable at Jones Design Company (thank you, Emily!). I printed it at 80% of its original size so it would fit in my 5" x 7" frame. I added a ceramic acorn and voila! My foyer is ready to welcome Autumn guests. Decorating doesn't get much simpler than this! What have you done to welcome Fall at your house? 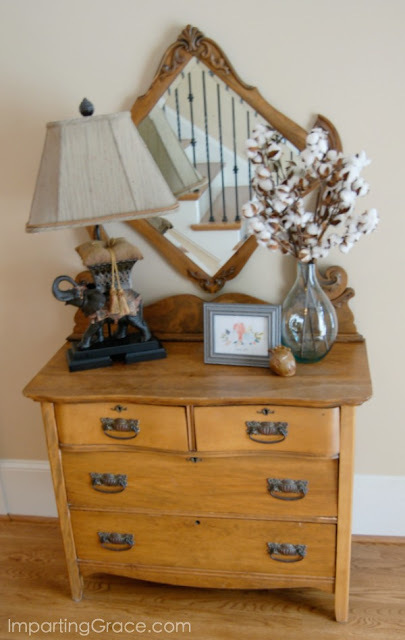 Hi Richella, I love your antique chest of drawers with the cotton in the vase. Here at my home, I don't decorate for Halloween(never did even when the girls were little)but I decorate for harvest and autumn. I've got lots spread out and will post a few tomorrow. 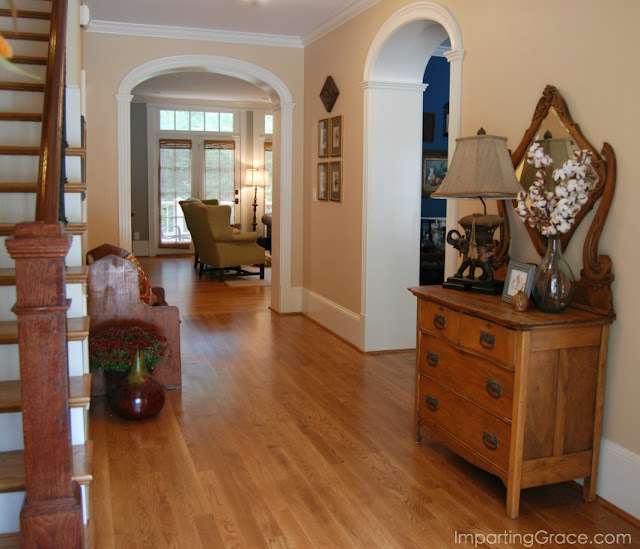 Love your foyer, and i certainly understand the lack of interest for decorating for Halloween! I am trying to size down all holiday decorations and would like to just scale down to a few things to place on my sofa table only! It's hard to do! That piece looks perfectly charming with your simple vignette, Richella! I'm kind of over-the-top crazy for cotton stems, too, and found mine last year at Michaels. I know they are a Fall-thing, but I usually find a way to use them all year long....well, they might have to have a rest during Christmas....lol! 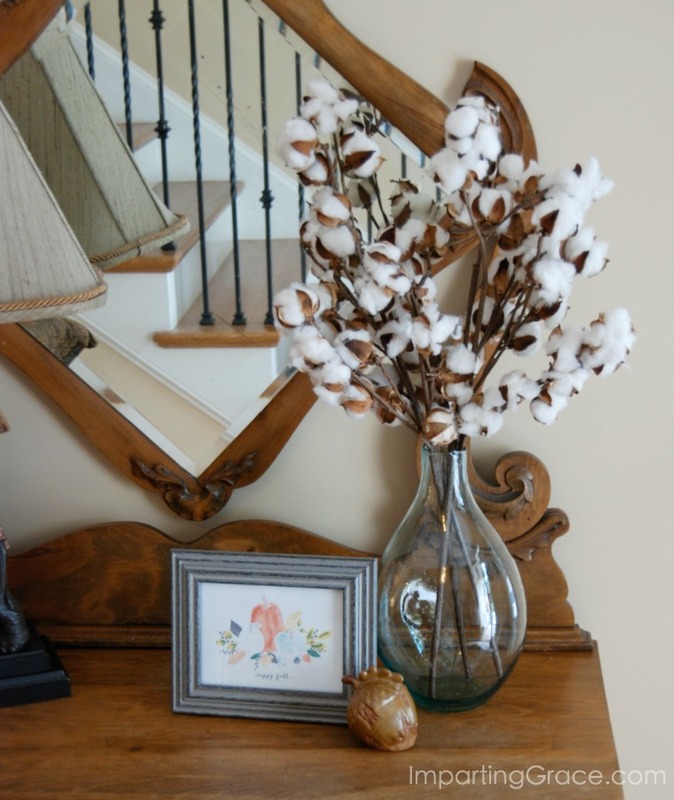 I love the cotton stems you have put in the foyer. We have been grain farmers, so naturally I think of sheaves of wheat since I am born and raised a prairie girl. I like your simple entry way...just the right amount of autumn. Have a great day! 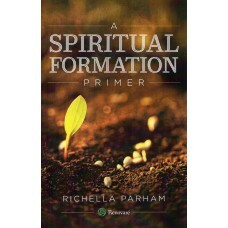 Richella, that looks really pretty! I always love seeing peeks of your house in every season. These are really looking very beautiful, you can also Buy home decor online India and saves your time. This vignette is adorable, dear one!!! I believe in simplistic styling!!! Thanks for sharing about the cotton and your family heritage!! !